IN 1934, IN THE GRIP OF POST-REVOLUTIONARY HARDSHIPS, WHEN ART NOUVEAU WAS ALREADY, IRREVERSIBLY, A THING OF THE PAST - PART OF A HAPPY-GO-LUCKY GONE ERA IN WHICH YOUTH HAD LIVED, AND INSPIRED DEBATES ABOUT ART UNFOLDED ON THE PAGES OF THE MAGAZINES "WORLD OF ART" AND "APOLLO", AND A ROMANTIC ARTIST'S STUDIO SOARING ABOVE THE STAGE OF THE MARIINSKY THEATRE WITNESSED "POETIC" DUELS - MIKHAIL KUZMIN WROTE IN HIS DIARY: "SPRINGTIME. EVERYTHING IS IN BLOSSOM, AND THE VIEW FROM THE WINDOW IS LIKE GOLOVIN'S BLIND MAGAZINE COVERS: THE ENTIRE SPACE IS FILLED WITH GREEN ORNAMENTS OF DIFFERENT SHADES OF COLOUR... IT IS A PLEASURE AND JOY TO WATCH HOW THE BUDS ARE OPENING, THE GRASS IS GROWING, ALL IS LIMPID, AND TWIGS ARE ELEGANT (PICTURE VERSUS COLOURATION)". 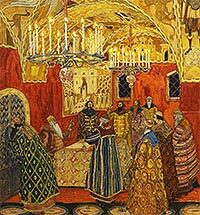 ON OCTOBER 2 1921 IN PETROGRAD, STRAVINSKY'S BALLET "THE FIREBIRD", DESIGNED BY ALEXANDER GOLOVIN, PREMIERED AT THE ACADEMIC THEATRE OF OpERA AND Ballet (Formerly The MARIINSKY Theatre). 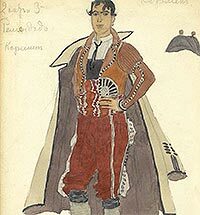 IT WAS The Finale OF A CONFUCT, BETWEEN The IMPERIAL THEATRES AND SERGEI DIAGHILEV'S COMPANY, WHICH HAD BEEN RUNNING THROUGH THE 1910S - A CONFRONTATION IN WHICH GOLOVIN PLAYED AN IMPORTANT AND COMPLICATED ROLE, ACTING AS DIAGHILEV'S ASSOCIATE AND, AT THE SAME TIME, CHALLENGER. "WE'RE DELIGHTED, EXCITED, PROUD - ALL OUR THEATRE LOVES YOU, WE LOVINGLY EMBRACE YOU. "2 SO READ THE TELEGRAM SENT ТО ALEXANDER GOLOVIN IN DETSKOE SELO BY KONSTANTIN STANISLAVSKY, DIRECTOR OF THE MOSCOW ART THEATRE. 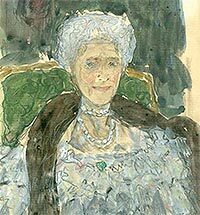 GOLOVIN RECEIVED SUCH TELEGRAMS AND LETTERS, FULL OF ADMIRATION AND ADORATION FOR HIS ARTISTIC TALENT, AFTER EVERY REVIEW OF HIS SKETCHES OF SETS AND COSTUMES FOR THE PRODUCTION OF BEAUMARCHAIS' COMEDY "THE MARRIAGE OF FIGARO, OR THE DAY OF MADNESS". 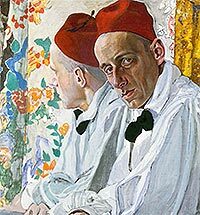 AMAZINGLY, FROM 1925 TO 1930, THE PERIOD WHEN GOLOVIN WORKED FOR THE MOSCOW ART THEATRE, HE NEVER ONCE TRAVELLED TO MOSCOW, NOR DID THE THEATRE'S CHIEF DIRECTOR VISIT THE ARTIST IN HIS LENINGRAD SECLUSION. 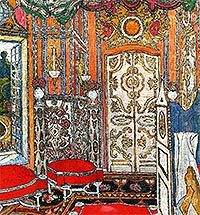 ALEXANDER GOLOVIN'S CONTRIBUTION TO THE EVOLUTION OF THEATRE DESIGN WAS AS GROUND-BREAKING AS THAT OF THE IMPRESSIONISTS ТО PAINTING. IT IS NO SURPRISE THAT, EVEN DURING HIS LIFETIME, HIS WORKS WERE PROMPTLY ACQUIRED BY PRIVATE COLLECTORS AND MUSEUMS. STRICTLY SPEAKING, AN ARTIST'S WORK FOR THE THEATRE COMPRISES HIS OR HER SET AND COSTUME DESIGNS, STAGE PROPS, AS WELL PORTRAITS OF ACTORS, THEATRE COLLEAGUES, AND OTHER DETAILS. 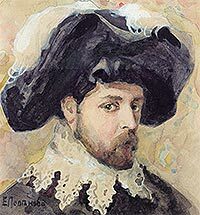 AS FOR GOLOVIN'S OEUVRE, PRACTICALLY ALL HIS WORK IS, IN FACT, THEATRE-RELATED TO A CERTAIN EXTENT, INCLUDING HIS STILL-LIFES, "IMAGINED" LANDSCAPES, PORTRAITS OF FRIENDS AND ACQUAINTANCES, AND HIS IMAGES OF "SPANISH WOMEN", OFTEN DEPICTING WOMEN WHO ACTUALLY WORKED FOR THE MARIINSKY THEATRE. 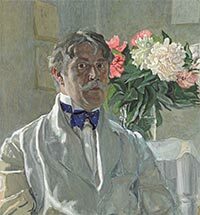 IN 1898 ALEXANDER GOLOVIN MADE THE ACQUAINTANCE OF VLADIMIR ARKADIEVICH TELYAKOVSKY, WHO HAD BEEN APPOINTED DIRECTOR OF THE MOSCOW BOARD OF THE IMPERIAL THEATRES THAT YEAR. 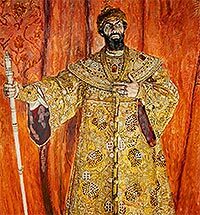 HE OFFERED GOLOVIN THE POSITION OF STAGE DESIGNER AT THE BOLSHOI THEATRE AND LATER, IN 1900, OF CHIEF CONSULTANT AT THE MARIINSKY THEATRE. THUS THE ARTIST WAS COMMISSIONED WITH A HUGE AMOUNT OF WORK DESIGNING STAGE SETS FOR BOTH MUSICAL AND DRAMATIC PRODUCTIONS IN THE CAPITAL, AND IN THE COURSE OF THIS WORK HE ACQUIRED HIS NOTION OF WHAT IT MEANT TO BE A THEATRE ARTIST. WHEN WE LOOK AT PAINTINGS, WE OFTEN WONDER WHAT THE ARTIST WAS LIKE IN REAL LIFE, WHAT EXCITED HIM, WHAT KIND OF PEOPLE SURROUNDED HIM, WHAT INSPIRED HIM TO CREATE HIS MASTERPIECES. IT IS NOT ALWAYS EASY TO FIND ANSWERS TO THESE QUESTIONS, EITHER IN THE ARTIST'S WORKS OR IN EXPERT STuDIES Of HIS OR HER OEuVRE. MEMOIRS AND CORRESPONDENCE SOMETIMES HELP US LIFT THE VEIL OF MYSTERY. 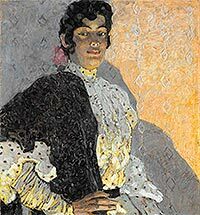 ALEXANDER GOLOVIN'S OWN "ENCOUNTERS AND IMPRESSIONS", PUBLISHED BY ERICH GOLLERBAKH, OUTLINED THE EXPERIENCES OF THE ARTIST'S LIFE; HE FOCUSED ON CULTURAL EVENTS, ON HIS ASSESSMENT OF VARIOUS PERSONALITIES AND PHENOMENA, BUT MUCH LESS ON HIS REFLECTIONS ON ART. THE ARTIST'S INNER WORLD AND HIS CREATIVE PROCESS REMAIN ALMOST ALWAYS "OFF THE RECORD".